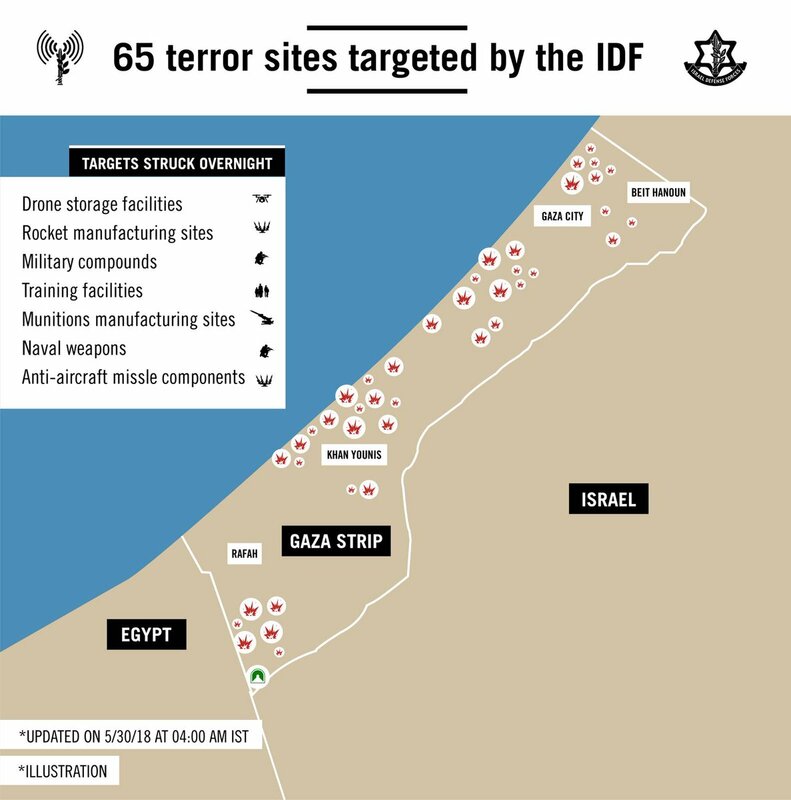 Since late March, Hamas has massed terrorists interspersed with civilians along the border. It has made repeated efforts – many successful – to destroy Israel’s border fence and penetrate Israeli territory. Hamas terror operatives have destroyed thousands of acres of Israeli farmland with incendiary devices flown over the border on kites and drones. The Palestinian Authority's practice of glorifying terrorists is a daily occurrence, well documented by Palestinian Media Watch. Funerals of terrorists provide an additional opportunity for the PA to laud them as heroes and often set the scene for incitement. To combat this phenomenon, Israel's government decided that, as a general rule, the bodies of terrorists would not be transferred to their families, but rather buried in designated cemeteries in Israel. In a rare divergence from this policy, in February this year, the bodies of two Palestinian terrorists - Nimr Mahmoud Ahmed Al-Jamal, murderer of 3 Israelis, and Hamza Zamaarah who after serving 14 years in prison for previous terror offences, attempted to stab an Israeli security guard - were transferred to their families. The release of their bodies resulted in mass glorification of these terrorists. Palestinian militants launched their heaviest barrages against Israel since the 2014 Gaza war on Tuesday and Israeli aircraft struck back, in a surge of fighting after weeks of border violence. Following scores of militant rocket and mortar launches throughout the day countered by Israeli tank fire and air strikes, the pro-Iran Islamic Jihad militant group said late Tuesday night that an Egyptian-brokered ceasefire agreement had been implemented, but Israel said reports of a deal were untrue. "Palestinian factions will abide by calm as long as (Israel) abides by it," Islamic Jihad spokesman Daoud Shehab said. An Israeli official who declined to be named said, "The report about a ceasefire is incorrect." According to Palestinian media reports Wednesday morning, a ceasefire was put in place around 5 a.m., although this has not been confirmed by the Israelis. Sirens which had been blaring regularly throughout the night, petered off as day broke in the region. As a result of the cautious calm, Israeli schools in the area surrounding the Gaza Strip are open and operating normally. Israeli sirens warning of imminent rocket and mortar strikes sounded all throughout the night in communities surrounding the Gaza Strip. Most of the projectiles were either intercepted by Israel's advanced Iron Dome missile defense system or landed in open fields. In one case, however a home in the city of Netivot was directly hit, but no one was injured. In response to the fire, Israeli aircraft hit 55 militant targets in the Palestinian coastal enclave, including a cross-border tunnel under construction, the military said. The rocket and mortar fire from Gaza has ceased because of significant strikes that the IDF carried out overnight in Gaza, a senior source in the Israeli defense establishment said Wednesday. “The IDF launched a significant strike overnight in Gaza and we have acted responsibly, and since the morning the fire has stopped. Israel has delivered a message that if the fire resumes, the attacks on Hamas and the other groups will intensify,” he said. “In recent months, Israel has acted with force and determination against any attempt to violate its sovereignty and/or harm the security of the residents of the south and it will continue to act with force against any attempt to violate the peace,” he said. Palestinian media quoted Hamas spokesman Fawzi Barhom as saying a “consensus was reached to return to the ceasefire understandings” in the Gaza Strip after “many hours” of meditation. 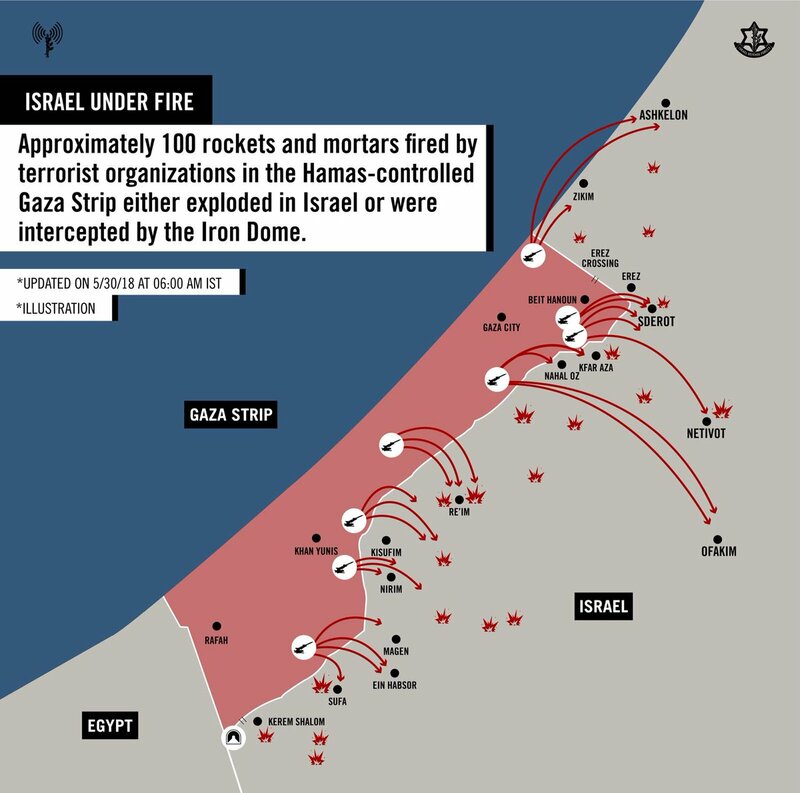 Israel’s Reshet Bet reported that over 180 rockets and mortars were launched towards Israeli civilian areas, and earlier on Wednesday the IDF released an infographic of 65 airstrikes carried against Hamas targets in the Gaza Strip in response to the over 24 hours of fire launched from the enclave. Seventy-five percent of children in Israeli communities near the border with the Gaza Strip showed up at school by 9:15 a.m. on Wednesday, despite a sleepless night of sirens due to rocket and mortar barrages fired by Palestinian terrorists. “It was not an easy night for the residents here,” Education Minister Naftali Bennett said at a news conference outside a primary school in the Sha’ar Hanegev region. “Between midnight and the early hours of the morning, there was a series of Code Red sirens and running to the shelters. “The heated situation on the Gazan side is neither accidental nor local,” he said. “The mastermind is an Iranian one, and the hands are of Hamas operatives. The State of Israel is engaged in a focused and consistent campaign against the head of the octopus in Iran. The octopus is operating its arms in Lebanon, Syria and Gaza to harm the State of Israel. An Israeli family near the Gaza border awoke on Wednesday morning to discover their porch had suffered a direct hit from a rocket fired from the coastal enclave. Naomi and Roni Fletcher had spent the night in the fortified room of their home in the Eshkol region. When they stepped into their garden in the morning, they found a crater from a rocket that caused significant damage to a shed adjacent to the house, Naomi Fletcher told Hadashot television. The rocket impact caused a meter-wide hole in the floor and destroyed nearby garden furniture. “When the [rocket alert] siren went off at 11 p.m., my husband said we weren’t going to be able to sleep if we had to wake up every time [a rocket was launched from Gaza], so we went to sleep in the secure room,” she added. The Trump administration on Tuesday condemned the Gazan attack on Israel that began in the early hours and continued through the evening. One official called the attacks “reprehensible,” while another told The Jerusalem Post that they justified “preventative” measures taken by the Israeli military – actions previewed earlier by Prime Minister Benjamin Netanyahu, who has vowed a response to the worst day of projectile fire on the South since the 2014 Gaza War (Operation Protective Edge). “We are aware of numerous mortar attacks on Israel today and are closely monitoring the situation, ” a National Security Council spokesman told the Post. “ We call on those launching the attacks to cease this destructive violence. “We fully support Israel’s right to self-defense,” the official added, “and to take action to prevent such provocations. The United States called on the United Nations Security Council to hold an emergency meeting Wednesday in New York to condemn the Gaza rocket and mortar attacks against Israel. “The recent attacks out of Gaza are the largest we have seen since 2014. Mortars fired by Palestinian militants hit civilian infrastructure, including a kindergarten,” US Ambassador to the UN Nikki Haley said in a statement she issue to the media. “The Security Council should be outraged and respond to this latest bout of violence directed at innocent Israeli civilians, and the Palestinian leadership needs to be held accountable for what they’re allowing to happen in Gaza,” she said. Earlier this month, the UNSC held an emergency meeting to blast Israel for using “excessive force” in combating the violent riots and infiltration attempts along its Gaza border that began on March 30.
International law: Valid justification or threat mechanism? ‘International law” has become a term commonly used by anti-Israel organizations. “In violation of international law” is what we hear in the media, in parliaments, and even in Israel’s Supreme Court. These words, which seem to require no further explanation or justification, have become employed to suggest, or downright assert, that the conduct of the IDF is illegal. But is this really the case? In recent weeks, the State of Israel has been facing a new threat, in the form of a massive mob marching from Gaza toward the border fences and attempting to cross them, with cries of hate and calls for murder emanating from loudspeakers used by the march’s organizer, Hamas. Terrorists trying to breach the fence with bombs and attempting to harm, destroy and murder are carrying out their attacks daily, using a variety of methods, including flammable kites. 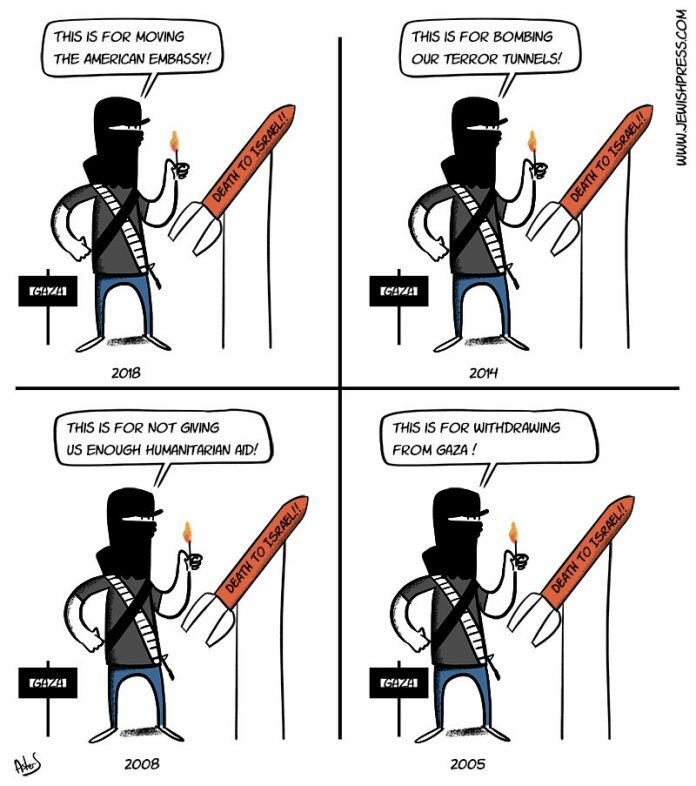 Hamas’s strategy, however, is not built on these terrorist tactics alone. Another, and perhaps even more significant aspect of the campaign is carried out in the public sphere and media by those that promote misinformation about Israel and its delegitimization around the world. In a manner that proved itself very effective for terrorist campaigns in the past, several radical organizations recently petitioned the Israeli High Court of Justice against the State of Israel and against the IDF’s protocols. Similar to the arguments made by various international voices on the events taking place on the Gaza border in recent weeks, “international law,” of course, was a significant part of their claims. Given that “international law” seems to be the current motto used by anti-Israeli organizations to attack the IDF’s conduct, let us examine together some of the principles of international law relevant to this context. Tom Gross: As UK government demands Israel investigation, why not first investigate 2017 UK bombing in Mosul? 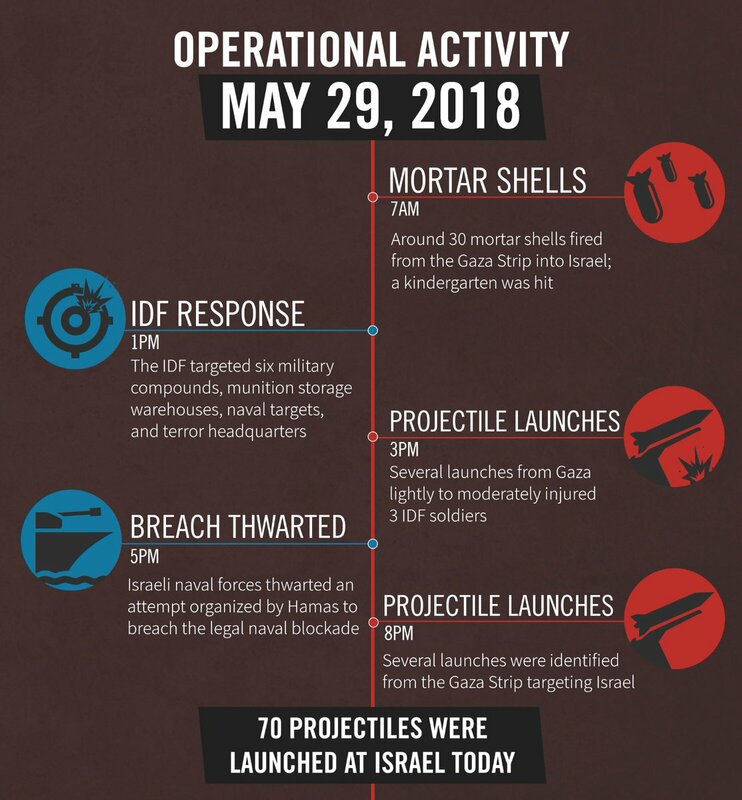 Since yesterday, over 130 rockets and mortar shells have been launched at Israel, the largest projectile barrage from Gaza targeting Israel since the 2014 war. One actually struck the yard of a kindergarten shortly before children were due to arrive. Thankfully, no-one was killed, despite the intent of those firing them. Yes, make no mistake about it: those firing the rockets are deliberately aiming at Israeli population centers, striving to cause mass casualties. At the same time, they know Israel will respond, and are hoping the response will involve the death of their own civilians. (To help that process along, they tend to fire their rocket launchers from civilian neighborhoods in Gaza). There has actually been quite a bit of unequivocal condemnation without the usual “cycle of violence” palava. Of the more than 60 deaths that occurred during the recent clashes between Israel and Palestinians at the Gaza border, none was as divisive as that of Layla Ghandour. Ghandour, an 8-month-old girl, died after an uncle, himself only 12, brought her to the edge of the protest zone, where she was reported to have inhaled Israeli tear gas. Palestinians immediately raised Ghandour as a symbol of Israeli oppression, elevating the infant to the status of martyr and blaming the Israeli army for her death. Many Israelis, meanwhile, countered in angry social media posts that it was irresponsible to allow a child into what essentially was a war zone. Both Hamas and the Israel Defense Forces issued statements, even as reports filtered out that the child had suffered from a preexisting heart ailment that may have contributed to her untimely death. Ghandour became a pawn in a by-now-familiar game played whenever Israel and the Palestinians clash. Flareups follow a pattern in which initial impressions — and condemnations — are replaced by a more nuanced understanding of events as more information becomes available. Next come bitter partisan battles over what actually happened. Finally, among pundits, media critics, spokespeople and social media users, the discussion shifts from what happened to the credibility of the press itself. Why Does a NY Times Journalist Want to Suppress an Anti-Hamas Article? A New York Times journalist thinks the Wall Street Journal shouldn't have published an opinion piece criticizing Hamas's anti-Israel propaganda campaign. The reporter, Declan Walsh, is one of the Times reporters who has covered the recent clashes along the Gaza Strip's border with Israel. Walsh concurred. "Fair question," he responded on Twitter. What arguments does the Wall Street Journal piece make that are so egregious, so beyond the pale, that they prompted these two journalists to wish editors had suppressed it? And what exactly did the author of the Op-Ed, an Israeli army spokesman, say about journalists being "naive, incompetent apologists for terror"? In fact, the piece was almost entirely focused on Hamas, its goals, and its propaganda. It charged Hamas leaders with lying when describing the Gaza demonstrations they organized as a "peaceful protest," and lamented that "much of the world simply fell for it." And it said that "some in the media helped Hamas by publishing its lies rather than facts." Still located in Jerusalem, Bateman returned to report on the same story in the evening edition of ‘Newshour’ (from 50:14 here). Presenter Julian Marshall stuck to the BBC’s editorial line by failing to inform listeners that over 80% of the people he portrayed simply as “Palestinians” were linked to terrorist groups. Bateman began with the inaccurate claim that “sirens sounded across southern Israel” when in fact that they were initially confined to areas close to the border with the Gaza Strip. “It said the tunnel stretched for 900m (3,000ft) under Israeli territory. It is the latest in a series of cross-border tunnels which Israel has destroyed or disabled since the end of the 2014 Israel-Gaza war. In line with previous editorial policy, BBC audiences were not informed of the fact that serious damage has been done to that “lifeline” on three separate occasions this month by Palestinian rioters directed by Hamas. The BBC’s description of the location of the kidnapping of Gilad Shalit lacks accuracy. The BBC failed to inform its audiences that Hamas and the Iranian backed PIJ had claimed joint responsibility for the day’s attacks. No mention was made of the fact that equipment and lines supplying power to the southern Gaza Strip were damaged by the terror groups’ missile fire. Despite the areas under attack being less than a two-hour drive away from the BBC’s Jerusalem bureau, once again the corporation’s audiences did not see any interviews with Israeli civilians affected by the terror attacks. She is, after all, a detestable terror supporter and Jew hater who pines for Israel’s destruction. Then again, here I was thinking she blamed the terrorism on drugs. Frustrated Palestinians engaged in wanton destruction of Israeli property and in malicious violence toward Jews cannot think of other ways to demonstrate to the international community their unassailable status as pure victims of Israeli oppression. Leaders of all the major factions in Palestinian society expressed deep vexation today following more than a century of futile effort at making a convincing case for their people’s unadulterated victimhood, confessing that other than hurling firebombs and rocks at Israeli motorists, hacking Israeli families and Rabbis to death, blowing up Israeli buses, hotels, and restaurants with bombs, burning Israeli fields and woodland, destroying Israeli farming equipment and facilities, killing Israelis in gun attacks, driving motor vehicles into Israeli pedestrians, and other deadly avenues for venting discontent, they remain unable to identify behaviors that might drive home the argument. Major Fatah, Hamas, Islamic Jihad, and Popular Front for the Liberation of Palestine figures told PreOccupied Territory in separate telephone conversations Wednesday that they remain at a loss to come up with alternatives to their chosen courses of violent action over the last hundred years that would provide conclusive evidence for the world that they must intervene in the Palestinians’ favor, as the latter have done nothing to provoke or explain their treatment at the hands of Jews during that time. Yesterday, Europe’s foreign ministers met to discuss the recent violence on Israel’s border with Gaza. The working lunch concluded without the release of a joint statement, suggesting diverging opinions. That shouldn’t come as much of a surprise: While Ireland, for example, has expressed concern over Israel’s use of force, the Czech Republic has called Hamas’s attempts to rush the fence a form of terrorism. But while consensus eludes Europe’s finest diplomats, on one matter they ought to stand firmly united: It’s time to bring Hadar Goldin and Oron Shaul back home. Against the ruling of the Geneva Conventions and the dictates of basic human decency, Goldin’s body is still held hostage by Hamas, as is that of Shaul, killed and kidnapped by the terrorist organization a few weeks earlier, in July of 2014. Ghoulishly, the terrorist organization occasionally releases songs in Hebrew, taunting the Goldin and Shaul families that they’ll never get to reunite with their fallen sons. Tom Gross: Should the UK now move its embassy to Jerusalem? Will it help peace? The Defense Ministry committee responsible for authorizing settlement construction advanced plans for nearly 2,000 homes in the West Bank on Wednesday. Roughly half of the homes advanced will be located in isolated settlements, outside the so-called settlement blocs that most Israeli leaders argue will remain part of the Jewish state in any peace deal with the Palestinians. Among the plans that gained final approval for construction was a 102-home project in the South Hebron Hills settlement of Negohot. Border police officers arrested a Palestinian man on Wednesday after they discovered a handgun hidden in his car near the Israeli settlement of Shilo, north of Jerusalem, police said. The man was driving in a way officers described as “suspicious” in the early hours of the morning. Officers, who stopped the car and searched it, discovered the Colt-style handgun, along with several magazines and a holster for the pistol, hidden in the vehicle’s gearbox. The man who is in his 40s, is a resident of Nablus, some 20 kilometers (12.5 miles) north of Shiloh. On Tuesday, two Palestinians broke into an empty house in the Har Bracha settlement. Israeli soldiers opened fire on the Palestinians, injuring one of them in the lower body and then capturing him. The second one fled and was later arrested, police said. Mohamed Zaouari, 49, was killed in a hail of bullets outside his house in the Tunisian city of Sfax in December of 2016. "The Supreme court accepted the appeal of the suspect... and rejected the request for extradition from the Republic of Tunisia," the court said in a statement quoted by AFP. Camdzic was arrested in Croatia on March 13 on an international warrant and has been held in custody since, the court in Velika Gorica, near Zagreb, said in a statement. His arrest was announced by Tunisian prosecutors who said they believed that two people with Bosnian passports had carried out the killing. The second suspect, Elvir Sarac, was briefly detained in Sarajevo earlier this week but released when a court refused to hand him over to Tunisia, saying there was no extradition deal between the countries. Hamas said two days after Zaouari’s death that he was a member of the organization's military wing and one of the leaders of its drone program. The group at the time also blamed Israel for his death. A prominent legislator from the mostly-Arab alliance of parties in the Knesset stopped short of calling mortar and rocket fire from Gaza at Israeli communities an acceptable course of action for Palestinians, but insisted mortar and rocket fire from Gaza at Israeli communities is an acceptable course of action for Palestinians. MK Haneen Zoabi, who has in the past courted controversy for staunch anti-Israel rhetoric, sought to assuage concerns today that she had justified Palestinian attacks on Israeli civilians such as the mortar attacks on Tuesday that included dozens of shells and injured 4 people, as well as hit a preschool just before the children arrived. Zoabi assured reporters that she should not be misunderstood as condoning or endorsing such wanton violence, while she merely sought to condone or endorse such wanton violence. “I’m not saying it’s OK for Palestinians to resort to potentially deadly attacks against Israel under the rubric of ‘resistance to occupation,’ but it’s OK for Palestinians to target Israelis for deadly attacks as a form of legitimate resistance to occupation,” she stated this morning. A Lebanese court on Tuesday charged a high-ranking officer with "fabricating" evidence that a prominent actor and writer had been illegally conspiring with Israel, a judicial source told AFP. Lebanon, which technically remains at war with its southern neighbor, upholds a boycott of Israeli products and of contact with its nationals. Lieutenant Colonel Suzanne Hajj "was charged with fabricating the case of collaboration with Israel brought against actor Ziad Itani, as well as hacking websites and inventing non-existent crimes", the judicial source said. Hajj, who headed a unit in Lebanon's Internal Security Forces tasked with fighting cybercrime, was detained for questioning in March over suspicions she had enlisted the help of a hacker to fabricate conversations between Itani and an Israeli woman. She remained in detention until Tuesday, and was released on the condition that she would continue to appear at the military tribunal for hearings, the source said. The charges against her are yet another chapter in the strange case. A senior commander and other members of the Iranian-backed, Lebanon-based Hezbollah terror group were killed overnight in an Israeli airstrike, Sky’s Arabic-language channel reported Tuesday. The strikes reportedly took place near the Syrian town of Al-Qusayr in the Homs district, close to the Lebanese border. There was no Israeli comment on the report. It cited sources saying the strikes destroyed a coordination center for operations and set fire to various places. On Thursday, airstrikes attributed to the IDF destroyed Hezbollah munitions depots at the al-Qusayr airbase, the Britain-based Syrian Observatory for Human Rights monitoring group said. Daba’a is another name for the al-Qusayr airbase, and the surrounding area is known to be a stronghold for Hezbollah and Iran-backed militias. It was also reportedly struck by Israel in a raid during an exchange with Syrian and Iranian forces on May 10. Hezbollah chief Hassan Nasrallah has amassed a net personal worth of around $250 million due to his organization's illegal drug smuggling operations, Al-Ittihad, an Arabic language newspaper published in the United Arab Emirates, reported on Monday. According to the report, which relies on senior Lebanese government sources, the scope of Nasrallah's fortune was discovered within the framework of a U.S. Drug Enforcement Administration investigation against Hezbollah – which aside from its designation as a terrorist organization also operates as one of the largest drug cartels in the world. Due to economic sanctions the U.S. has reimposed on Iran and the massive reduction of Tehran's budget to Hezbollah, Al-Ittihad reported, compounded by the heavy financial toll exacted by involvement in the Syrian civil war, Nasrallah ordered an expansion of the organization's drug-related activities – which resulted in extensive financial gains for Hezbollah and a personal windfall for Nasrallah himself. Nasrallah, the report continued, appointed his most trusted associates to closely oversee the organization's drug smuggling operations. The last remaining Jewish citizen in Afghanistan finds himself among a small group of non-Muslim religious minorities who have become a target of a deadly persecution campaign at the hands of the Islamic State (ISIS/ISIL) and the Taliban, the U.S. Department of State (DOS) mentions in a report released on Tuesday. Sikhs, Hindus, Christians, and other non-Muslim minority groups reported continued harassment from some Muslims, although Hindus and Sikhs stated they were able to practice their respective religions in public. Christian groups reported public opinion remained hostile towards converts and to Christian proselytization. Christians and Ahmadi Muslims stated they continued to worship privately to avoid societal discrimination and persecution.